Fooling Around, or as we locals call it “Fuliranje”, is one of the best Zagreb Christmas Markets. Embrace excellent music, exceptional food and entertainment. Fooling Around (Fuliranje) is famous for their fresh concept and amazing vibes. 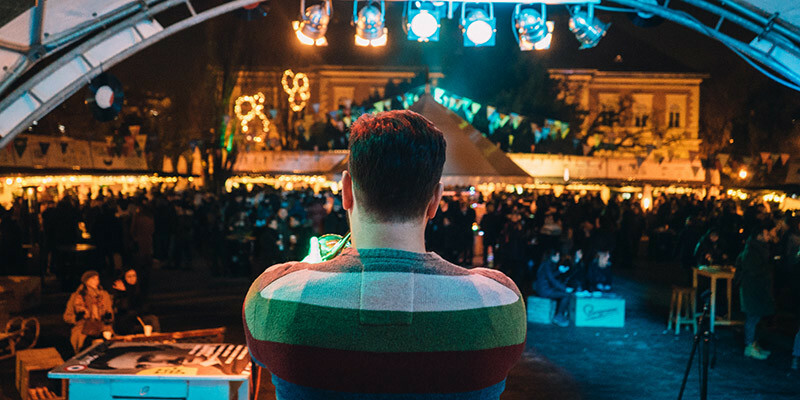 From November 29, 2018, until January 1, 2019, be sure to visit Zagreb’s best Christmas Market and enjoy the best food and entertainment. Hopefully, my guide will help you with that. I’m making this guide a bit different I want you to know what to expect, and where to find it. TIPS: Pay with Mastercard® or Maestro® and get 10% off! Every Monday, except Christmas Eve, from 12 noon to 4 PM enjoy classical music concerts performed in association with the Zagreb Music Academy. Don’t miss out December 8th at 8 PM. Queen Real Tribute Band honours Freddie Mercury and one of the best bands in music history. I’m especially happy that this year Fooling Around (Fuliranje) is going global. What does that mean? Their music program and food offer went international. But don’t think you won’t find some genuinely local flavours. If you continue to read on, I promise, you won’t know where to start. But first thing’s first, entertainment, Fuliranje will have over 60 performers. 12 international and 25 regional DJs and seven bands. Names like Danny Krivit, Justin Robertson, Big Danny Kane, Dean Sunshine Smith, Bobby Beige, Ilija Rudman, Antonio Zuza and Felver are just a few of them. Children choirs will take care for the comfy Sunday atmosphere. And on Mondays enjoy the classic with Zagreb’s Music Academy. During New Year’s dance your heart out with Defected featuring Todd Terry, PEZNT, Andy Daniell, Black Soul and many others. For Free! Now we get to the tasty part. Fooling Around (Fuliranje) hosts around 40 of the best Croatian restaurants. Most of which made some truly unique dishes, especially for Zagreb Advent and Christmas Market. Flavours to keep you warm and hungry for more. They call it a gastronomic empire, I call it a gastronomic wonderland! They bring us the best of the best street and soul food. Either nearly forgotten traditional Croatian dishes, or some unusual and delicious international meals. Local meals like “sarma”, “buncek”, beans and duck with “mlinci”. As for international think of Scandinavian, Swiss, South American and Asian specialities. And for the sweet tooth sweets from Austria, Czech Republic and Spain. 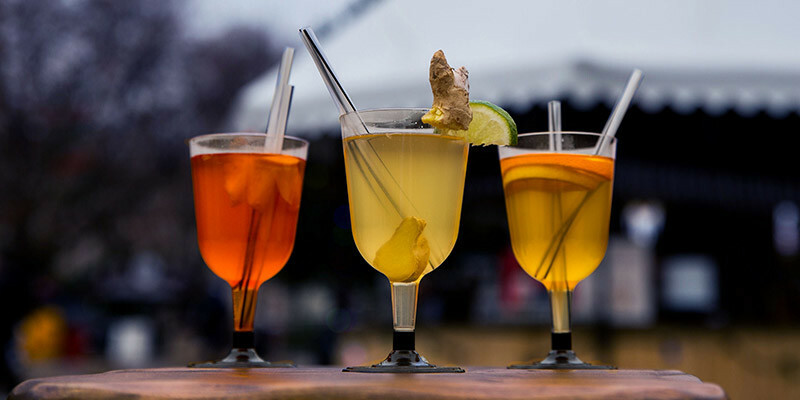 Regardless what you want to try, you should start and warm yourself with traditional mulled wine, hot and colourful cocktails and brandies from all over the world. As for beer lovers, be sure to try The Garden Brewery unique Fuliranje craft beer. 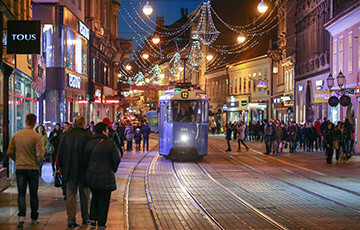 You plan on visiting Zagreb Advent, and Christmas Market don’t miss out on Fuliranje. They were voted top Zagreb Christmas Market, and although this year they have their work cut out for them you should definitely Fool Around in Zagreb. Check out last years atmosphere. What to See and Do at Fooling Around (Fuliranje)? What to Eat & Drink at Fooling Around? Fooling Around (Fuliranje) unquestionably pushes the bar every year. 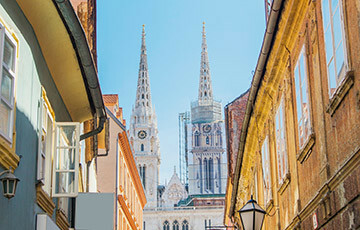 Croatia’s Top Chefs and Restaurants make unique flavours for Zagreb Advent and keep deliciously shocking us year after year. I’m not going to go booth by booth. Instead, I’m going to talk about the dishes, and where to find them. Let’s start with the last years favourite, Street Sarma. With its last year debut, it was bound to come back. Traditional “Sarma” is basically minced meat with a combination of rice wrapped and cooked in sour cabbage. It might not sound excellent, but it has been among favourite Croatian winter dishes for ages. 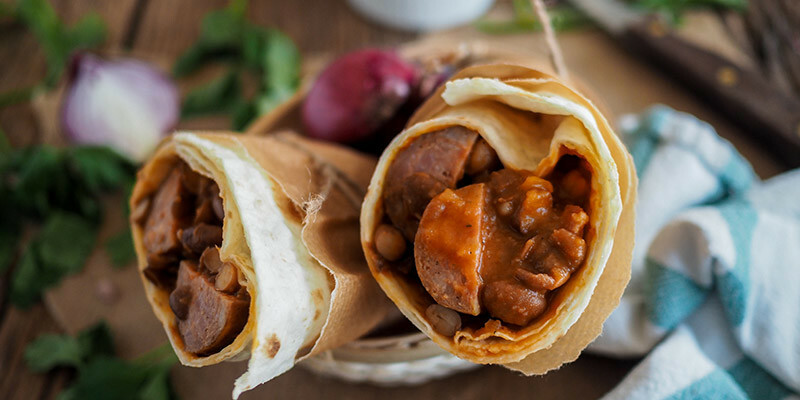 Street Sarma can be found ad the T&T house and although all their meals are amazing, this year favourite just might be their Beans & Sausage 2 Go. Classic Sarma can be found at Mime’s gourmet bar, and another alternative is TIME restaurant & bar Sarma Sausage. 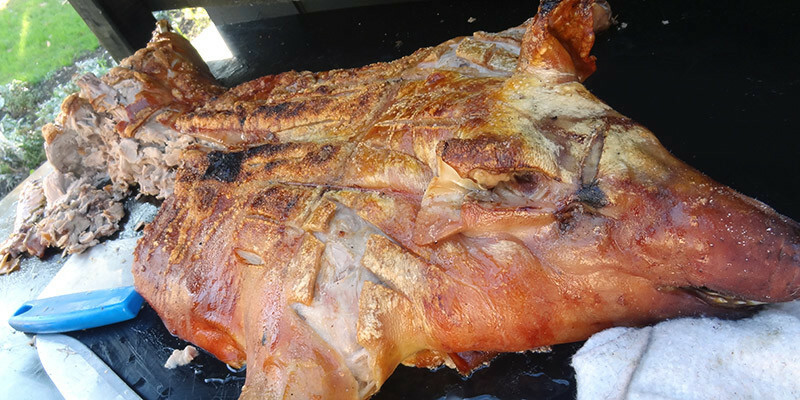 Next in line is BarBaQ, and Mojmir Žuvela’s love for meat. What you will find is something truly amazing. Slowly roasted piglet with braised potatoes and sour cabbage, and oh boy… it’s scrumptious. The meat is prepared in a so-called Chinese box, slowly roasted 5 to 6 hours and what comes out is something truly remarkable. Although this meal might come in the upper price range, it is worth it! Priced at 62 HRK, around 8.5 EUR, you will never taste such tender meat with a combination of potatoes and sour cabbage. Miomir opens up the box roughly twice a day, around 2 PM and 6 PM, and it goes out fast. 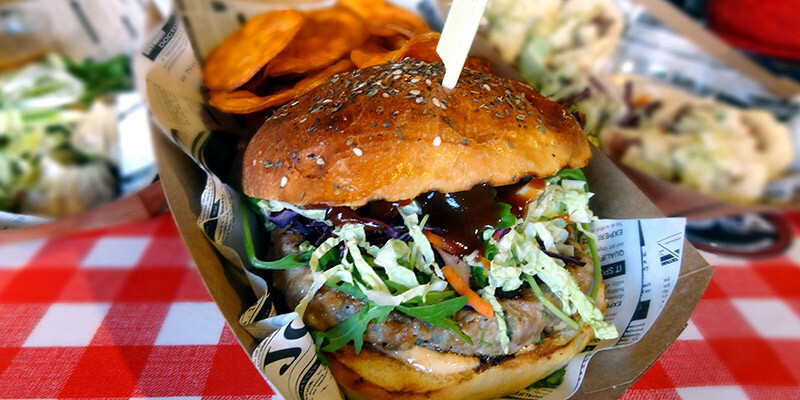 If you miss it, don’t worry, amazing Pork dishes can be found at the Lola Street Food, The Garden Bar & Kitchen and T&T House. Moving on to another Croatian winter tradition, Beans. There are several options available each with their own interpretation of this dish. 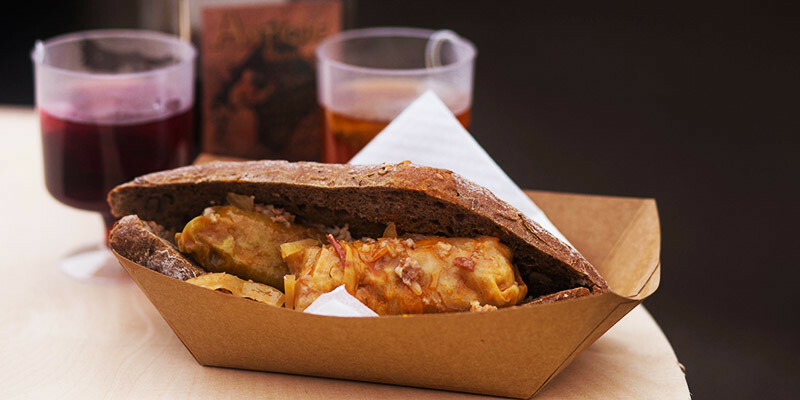 Mime’s gourmet bar “Pašta fažol” is classic beans stew and don’t think it’s not tasty. Mime’s is one of the rare houses that presents meals traditionally, and I must compliment that. What better to eat than warm stew dishes on cold winter days. Alongside a sweet alcoholic beverage. If you want to try out something with a twist, go for the TIME restaurant & bar Grinch Beans. And if you wish for beans on the Go, your best option is T&T’s Beans & Sausage 2 Go. 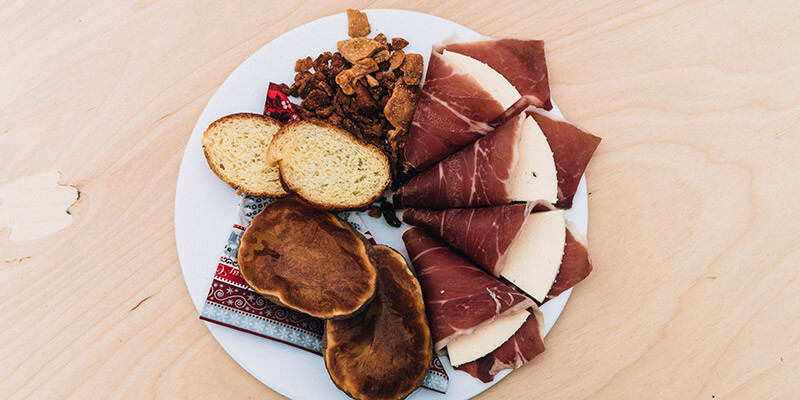 Let’s not forget about Istria and their delicacies. At “Fermaj tovara” house you can try out delicious Istrian Sausages and Ombolo. Both are amazing alongside other Istrian dishes, and they all come together with a nice glass of Istrian wine. You also have an opportunity to purchase one of their wines. Although some might think I should have started with cold starters, I’m going to finish the traditional meals with it. Not because you should end with it, but because it seems to me like a natural order of thing on cold winter days. I like to think of cold appetisers as party food, and I believe they should be shared and enjoyed with friends and family. That is where “Bakina padela” house kicks in with traditional Croatian starters as sour cream “basa”, baked potatoes, sour cabbage, the infamous “čvarci”, blood sausages, regular sausages and homemade cheese. I recommend all of these for a larger party. Zagreb had a burst of Burger restaurants among the years. And Fuliranje has some of the best of them! Although Submarine has several locations around Zagreb, they have their booth here, and they made some pretty good specials. You can try out their Xmas burger, but what caught my eye was the Winter burger with chestnut cream and Submarine Special sauce. Didn’t try it yet, but you can bet I’m gonna. Fooling Around wouldn’t be complete without Masons Burgers. 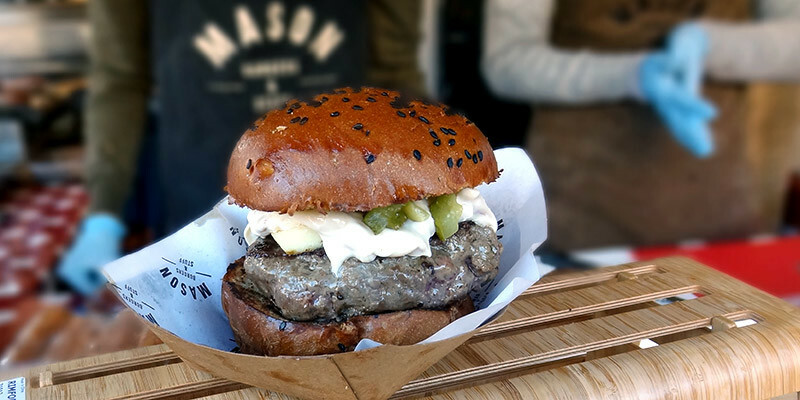 This years winner at Zagreb Burger Fest can be found at Rakijarnica & Mason Burgers booth right in the middle. 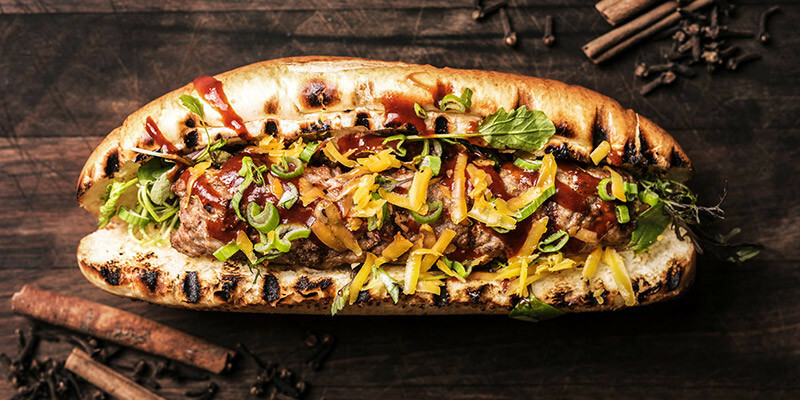 If you’re not into Burgers, try one of their homemade sausages. They go very well with any of their schnapses or special Fuliranje Craft Beer. When I talk about sausages, I’m not gonna tell you about the standard sausages found around Zagreb Advent. I’m going to point you to some newbies. And aren’t they full of surprises? Starting off with Masons. They have 3 types of sausages, all homemade and additive free. You’ll find them perfectly grilled and seasoned, the same as their burgers. Mr Bjorg, on the other hand, prepared a real treat. 3 Types of hotdogs, Danish, Swedish and Norwegian which go amazingly with their Glogg, Scandinavian Cider or one of their Winter Teas. If you’re a cheese fan like me, you’ll definitely love St. Moritz house and their special Swiss dog dressed in freshly melted Raclette cheese. Likewise, you can find boar sausages at Noina Tajna (Noah Secret), and various hotdog types at Papaya Winter House. For all of you trying to try out something new and different, head over to TIME restaurant & bar and try out their Thai Sausage. Homemade curry sausage with pineapple salad, bbq sauce, fried onions and chilli. For the first time during Zagreb Advent, you have fresh and homemade Pizza. Where? At Fuliranje Pizza & BBQ Buffalo house. You might think, oh it’s just a pizza, and you couldn’t be more wrong. Romano Seferović, the pizza chef, won 1st place for its Buffalo Pizza. 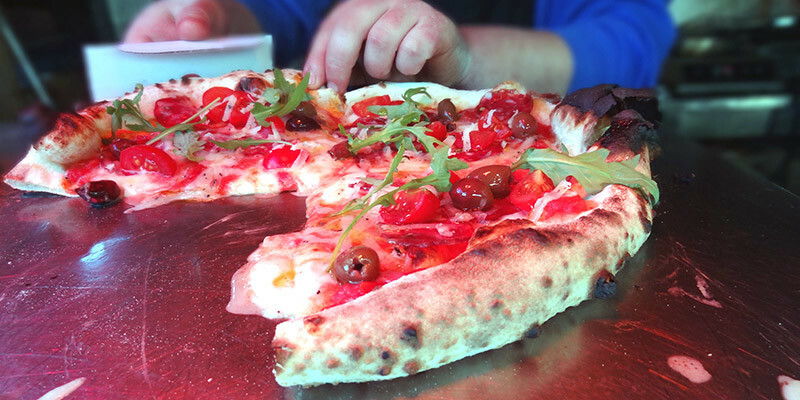 All made with fresh ingredients, mozzarella, boškarin sausage, olives, cherry tomatoes, truffle cheese and extra virgin olive oil make this pizza mouth watering. Its here at Fuliranje and to complement it they brought a real bread pizza oven, so you eat the real thing. They made several other Pizza options, and they should all be tried as they are all unique in their own way. Food can’t be all local and at Fooling Around you can try a wide variety of international meals. 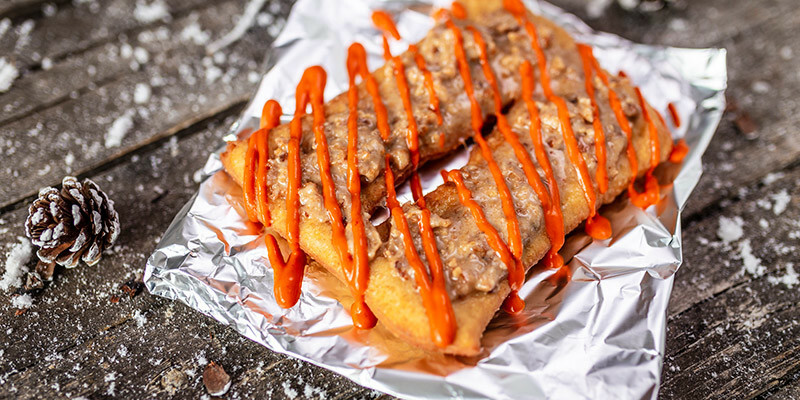 We’ll start off with Lola Street Food and their presentation of super delicious Dim Sum Chinese ravioli, Asian burger and their interpretation of Arancini. Their Arancini are actually fried rice balls with smoked mozzarella, blue cheese and dried tomatoes. Sounds delicious? Believe me, it is. Another marvellous Asian option is the Kansui Ramen bar. 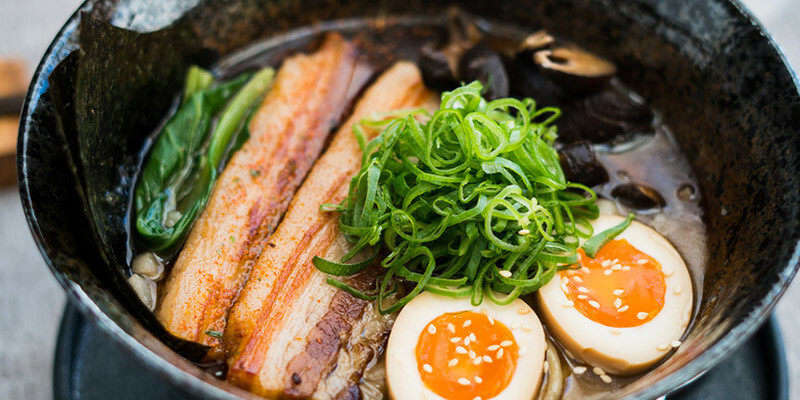 Offering traditional Japanese treats such as Pork Belly sandwiches, Vindaloo Lamb stew and their famous Tonkotsu ramen, as seen in the picture above. For you latino crazed fans, me as well, visit the El Toro Restaurant & Bar. Although somewhat adapted cuisine to local standards they serve up some delicious Southamerican quinoa, black beans and black wild rice dishes. We have a couple of newcomers as well. The first one Atelier Køkken, presenting itself for the first time in Zagreb, and they prepared a couple of surprises. They emphasise on Danish kitchen with their interpretation of infamous rod polse sausage. The other Breadclub, offering something a bit different, but also in a seasonal atmosphere. 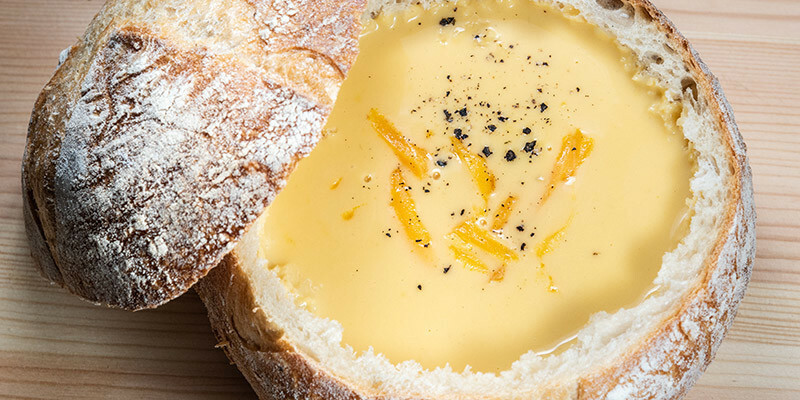 Warm up with their Bread potted soup. My personal favourite is the beer and cheese creamy soup. And for the classics, you have Mushroom soup. Both served in freshly baked bread potts. I’ve mentioned TIME restaurant & bar a couple of times, and that’s because they don’t have a lot of dishes, but they’re made with passion. Although their meals have local ingredients in them, they made them with a twist, and quite successfully I might add. My personal favourites are the Grinch beans and Time Bun. As you might have noticed, I’m not a vegetarian, but for a fact, I know that vegetarian can be super tasty. You can find vegetarian options at Munchy and the Breadclub. But here I have to point out Veganšpek booth. Although they have a small number of meat dishes, they have a separate prepping station for vegetarian meals. They truly take care of that, and they offer excellent tofu, falafel and tempeh options. 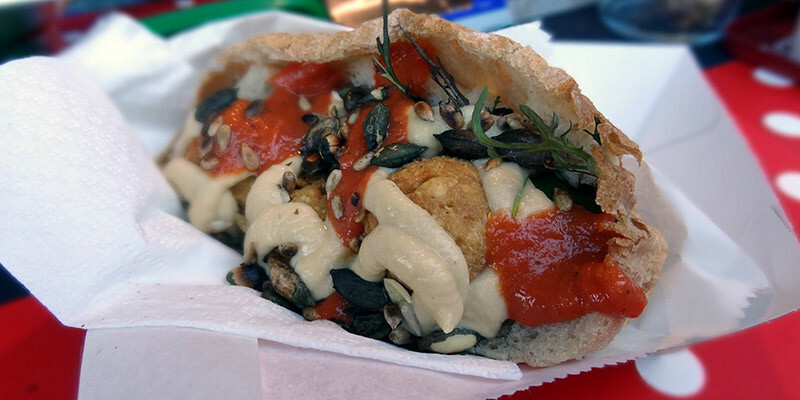 I tried the falafel, and it was prepared with perfection. The best thing you can have as many add-ons as you like. And make sure you try the pickled onions and their garlic and honey schnapps. I know it sounds weird, but it works. Finally, we came to deserts. Most booths have a wide variety of options. Personally, I’m a chocolate fan myself, and that is why I’m gonna focus on chocolate. Chiquita Churrosita brings us a fantastic Spanish delicacy. Churros, dough fried to perfection, sprinkled with sugar and dipped in warm chocolate. Take it as you enter Fooling Around and roam through. 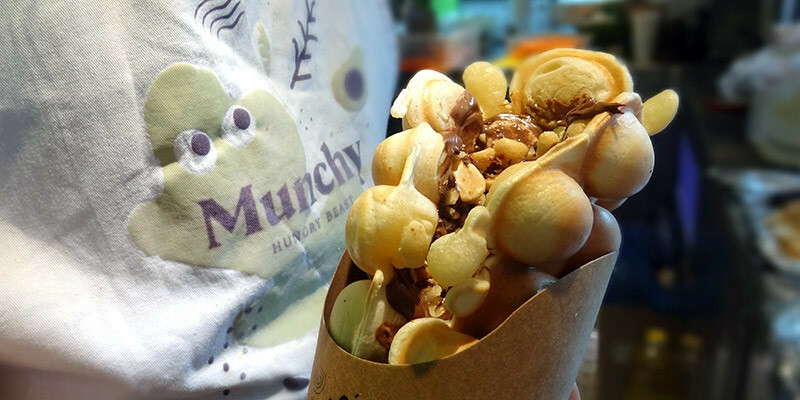 Hong Kong’s Bubble Waffle at Munchy is another absolute hit. I explicitly tried and immensely liked their combination of Nutella and peanuts. Majushka is a booth by Croatia’s Popstar Maja Šuput, and she brings us something different. Several options of winter ice cream out of which I mostly enjoyed the golden ice cream. Definitely worth mentioning is Rougemarins ripped undies, locally translated to “poderane gaće”. It is Lángos, deep-fried dough, topped with plum jam and whipped cream. A genuinely local and almost forgotten delicacy. Although you have a wide variety of options, I’m going to finish with germknödels. There are several booths offering germknödels where I can easily point you to Rougemarin and Sljeme booth, but also Lumperaj and St. Moritz. 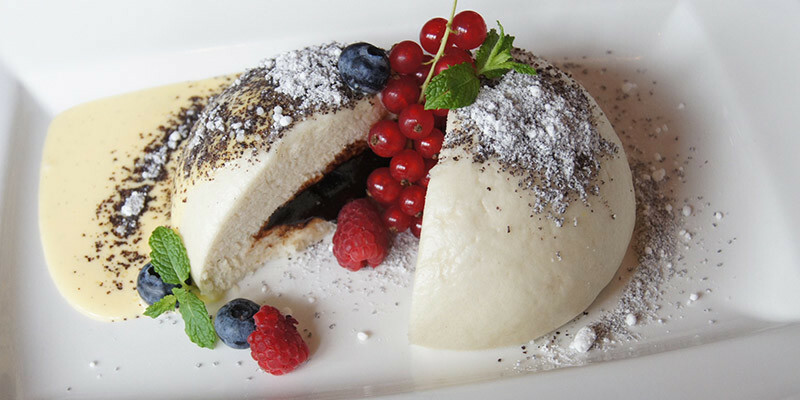 All of them are amazing, but I will point out St. Moritz’s germknödel with fruit filling covered in chocolate. A genuine chocolate bomb! And as I said, I’m a chocolate man myself. Lumperaj, on the other hand, does it a bit differently. Here you will find mini (but not so mini) germknödel braised in almond and edible tinsel. There are the classic fillings, filled with plum jam, but if you want to try out something new, go for the almond cream filling. In Croatia, we don’t lack in a diversity of both alcoholic and non-alcoholic beverages. Here I’m going to focus on the alcoholic ones. Fooling Around (Fuliranje), doesn’t fall short either. You’ll find their very own unique craft beer called Rosemary Julebryg at the Garden Brewery alongside other Craft beer options. Mulled wine is a Zagreb Advent tradition, and every booth has its own option. I especially enjoyed Veganšpek mulled wine, cooked with ginger. It gave it a unique kick. You will find roughly around 30 options of schnapps in the middle Rakijarnica & Mason Burgers. From sweet to sour. I personally love our local herbal schnappses, but my wife on the other hand always go for cherry or honey option. I believe whatever you choose, you won’t miss it! What I also noticed was mulled whisky and gin. Gin kinda seems especially popular this year. I tried the mulled version, my friends tried the classic Gin and tonic at the GINgle bells booth, and we loved it. You can’t get enough of it. And for all you cocktail fans, Papaya Winter House prepared amazing winter cocktails, especially for Zagreb Advent. 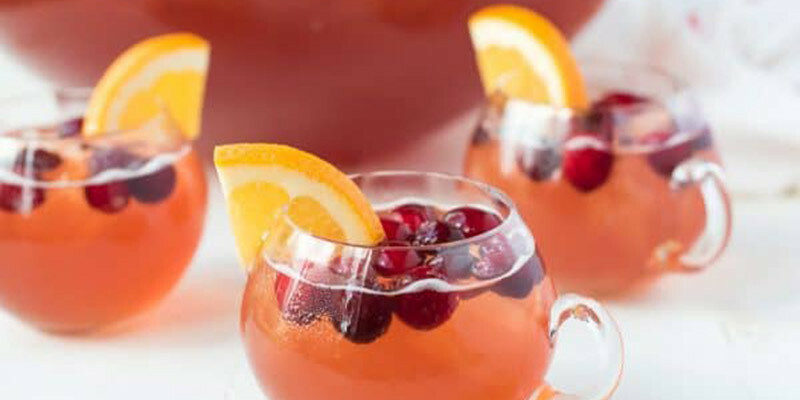 Gin, whisky or vodka cocktails amongst punch, mulled wine and tea. All designed to keep you warm and in a festive mood. Although Fooling Around (Fuliranje) has a majority of food and drink booths, don’t miss the opportunity and visit the ultimate shop, Here Be Dragons. They offer a massive selection of gifts and collectables from movies, tv series, and video games such as Harry Potter, Lord of the Rings, Game of Thrones, Marvel, DC and Star Wars. Be sure to stop by at the Samsung dome. You can warm up and have a chance to buy discounted premium Samsung devices. Likewise, stop by the FULiranje Fan Shop where you will find distinctive holiday gifts. For entertainment, among amazing Fooling Around (Fuliranje) program, kids can enjoy Santa’s Workshop with daily shows. During weekdays shows start at 5, 6 and 7 PM. On Saturday and Sunday, they organise two additional shows at 12 noon and 1 PM as well. Nearby be sure to try the Magical Carousel. You can also try out a ski simulator in the Triglav Security dome and various gaming challenges at the Playstation zone. 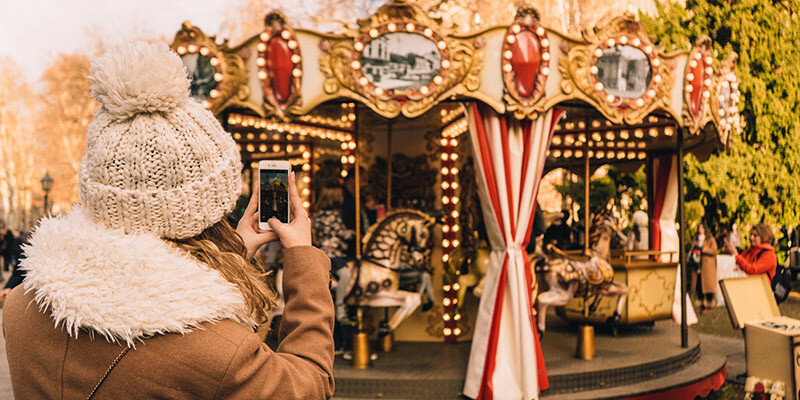 Warm up in the Jamnica Cosy Christmas Corner and continue to make memories at numerous photo spots. There is so much happening I mustn’t forget to mention a bistro for your pets called Capa Pet Bistro. While you explore Fuliranje, your pets can enjoy some pretty unique delicacies. Made especially for them. 5 PM – Alen S.
Defected featuring Todd Terry, PEZNT, Andy Daniell, Black Soul and many others. Free Entry! There you have it, my guide to Fooling Around (Fuliranje) at Zagreb Advent. For me the best Zagreb Christmas Market. With such a wide variety and rich cultural and entertaining program, I’ll be sure to keep coming back. I truly hope you find it helpful and make this holiday season filled with joy and Christmas spirit. Remember, Zagreb Advent is easily explorable on foot. Fill free to make your own combination of sights and hotspots. Please let us know your thoughts and share this article with your family and friends. 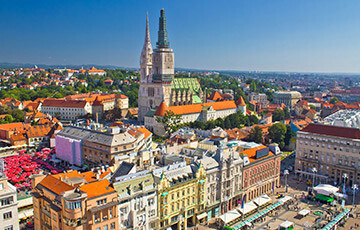 Let them know what Zagreb is all about.